Looking For Gutter Cleaning In CT? While power washing equipment is available for rent or sale, it is always best to take on exterior cleaning with the help of a trained professional. This is because proper training ensures the equipment is used in the right way, protecting yourself and your property. 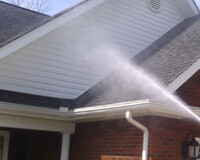 Skillful use of high pressured water can yield amazing results, but these water jets are powerful and can be dangerous. When you call on the experts at Blue Mobile Wash you avoid doing damage to yourself or your building. When we set out to clean your exterior, you will be amazed at how pristine we are able to get your surfaces. Without chipping or damaging your materials we can strip away every ounce of grime and dirt to reveal a shining surface underneath. We make concrete and brick look as new as the day it was built. Revitalize your building’s exterior and restore its beauty with power washing from Blue Mobile Wash.
Not only will you improve curb appeal you’ll also feel better about your surroundings. Cleanliness has the inherent ability to make people feel more comfortable. When you have a glimmering driveway or exterior walls, you know your building is representing you well. At Blue Mobile Wash we work hard to offer the most powerful and safest pressure washing available. Our power washing can get rid of any stain; from rust to set in oil, mildew, paint and more. Whether you have rusted paint can rings all over your patio or your garage is riddled with unsightly oil stains, Blue Mobile Wash can get it clean. Need Exterior & Interior Gutter Cleaning? I need Exterior & Interior Gutter Cleaning... can I get a free estimate?